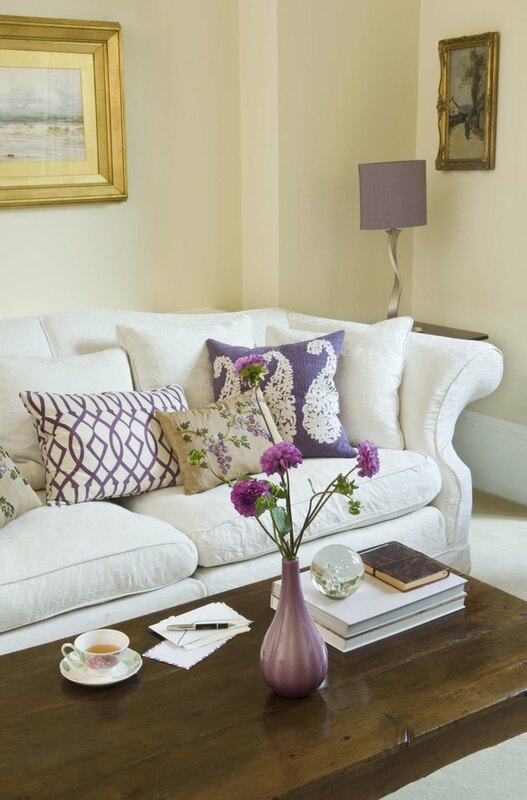 A mix of patterned pillows is the easiest way to bring interest to a room. However, choosing the right patterns to mix can be challenging. The trick is to select patterns that tie together and complement a look rather than create a feeling of chaos. Throw pillows in coordinating patterns tie the room together. Before you can begin to mix patterns, decide on the color or colors you wish to incorporate into the room. Select a color from the couch, area rug or window treatments to lead with, or bring in other coordinating colors for a visual punch in a neutral scheme. Whatever your color choice, be sure you love it. The process of mixing patterns is much more fun when you work with elements you like. Patterns fall into a couple of categories and vary by size and scale. There are the patterns commonly thought of as masculine, such as stripes, plaids and graphical geometrics, and then there are the ones thought of as more feminine, including florals, calico and damask. These patterns mix easily together with a common color scheme in mind. It is best, though, to limit the selection of patterns to two or three. Too many patterns thrust together causes chaos for the eye and can actually hurt to look at. There are several ways to prevent this problem. Start by limiting the number of patterned pillows on the couch to two, and then mix in a solid color. The solid color balances the patterns and gives the eye a place rest. Accessorize accent chairs with a third pattern to help tie the room together and create a sense of symmetry in the space. Connecting the patterns with a common color palette is appealing and creates cohesion in the space. Begin by selecting a color from the first pattern to use as the color choice for the second pattern. For example, a large-scale plaid featuring yellow, white, blue and green would pair well with a medium-scale white and blue floral pattern; a third pattern may be a small blue check. The common color connecting the three patterns is blue. Varying the scale of the pattern avoids a monotonous look and adds another layer of interest to the mix.